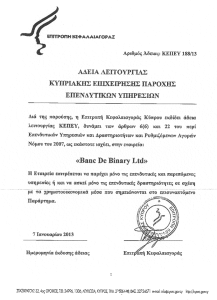 BinaryOptionsNow – The leading SpotOption brand, Banc de Binary today has announced that is it is officially recognized and regulated by CySEC in the European Union. Banc de binary is the first binary options broker to be regulated by CySEC. Known for being the most professional of the binary options brokers, Banc de binary continues to pave the way for this form of trading to become mainstream and easily accessible to anybody in the world. CySEC is the Cyprus Securities and Exchange Commission. Cyprus is a European Union recognized nation and is major hub for international markets and banking. After becoming part of European MiFID regulation in 2004, CySec provides regulation to firms not just in Cyprus but in the whole of the Europe Union. Banc de Binary was founded in 2009 making it one of the first binary options brokers. Providing clients with customized SpotOption software and premium services, Banc de Binary continues to be step ahead of its competition. Banc de Binary is a platform tailored to the needs of serious investors, due to this fact it was one of the first binary options brand to pursue being regulated and the first broker to achieve this goal. In order for Banc de Binary to become regulated with CySEC the firm was required to ensure that they meet a signification number of security standards and have sufficient capital to meet any of their customers financial needs. Banc de Binary was founded by the visionary entrepreneur Oren Laurent. Oren Laurent is one of the founding members of SpotOption which is the technology provider for the binary option firm.